This recently published small volume is a wonderful addition to the bookshelf and literature pertaining to anorexia nervosa. 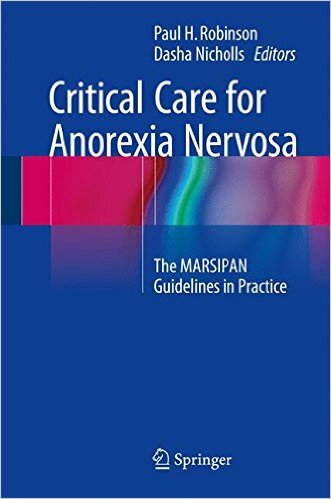 The book is based on the work of the MARSIPAN (Management of Really Sick Patients with Anorexia Nervosa) Guidelines Group. It is highly readable and well organized. An introductory chapter provides a number of case vignettes describing problems encountered when treating severely ill individuals with AN, which will be all too familiar to eating disorder practitioners. Thereafter, there are two chapters on the approach to child and adolescent patients and two regarding treatment of adult patients. In each instance, there is a chapter primarily from a mental health perspective and one primarily from a medical care perspective. Last, there is an interesting chapter on legal and ethical aspects of treating patients with severe AN. This book has a number of very useful aspects. For example, readers will find a thorough and thoughtful discussion of the role of nasogastric tube feeding, both in regard to adolescent and adult patients. The pediatrics- and medicine-oriented chapters provide thorough discussions of approaches to medical problems encountered in people with severe AN, and clearly reflect extensive knowledge and experience on the part of the authors. The issue of refeeding syndrome is an important one when treating people with severe AN, and that is well-covered. Another very useful aspect of this book is that the “issue of underfeeding” (providing calories far below that which would be tolerated and needed for recovery) is also discussed. The format includes many descriptive and illuminating cases. Finally, the chapter on ethical issues includes an appendix that provides a framework that could be used for trying to assess decisional capacity in AN. The treatment of individuals with severe AN is one of the great challenges of doing eating disorder work, and this volume provides very useful guidance for that task.